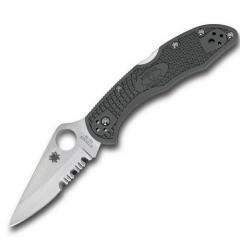 The Spyderco Delica4 is an updated version of their popular Delica folding knife. Designed for both civilian and military use, it features a versatile combination edge blade that slices and pierces effectively. The large hole makes it easy to deploy with wet or gloved hands, and its phosphor bronze washers provide a smooth action. Jimping on the spine enhances fine control for delicate tasks. The ergonomically shaped handle is made from fiberglass reinforced nylon, reinforced with skeletonized steel liners that strengthen it without adding excessive weight. It features unique molded Bi-Directional Texturing, which prevents the knife from slipping out of your hand in any direction, and carries a four-way pocket clip for versatile portability.